Care2 Healthy Living | Should We All Take Aspirin to Prevent Cancer? For people without a personal history of cardiovascular disease, aspirin’s risks may outweigh its benefits, but aspirin may have additional benefits. “We have long recognized the preventative role of daily aspirin for patients with atherosclerotic [heart] disease; however, it now appears that we can, so to speak, kill 2 birds with 1 stone” (or as I like to say, hatch 2 birds from 1 egg :). Daily low-dose aspirin may help prevent certain forms of cancer, as well. In an analysis of eight different studies involving more than 25,000 people, “the authors found a 20 percent decrease in risk of death from cancer among those randomized to daily aspirin…” The researchers wrote, “[T]he search for the most efficacious and safe treatments for malignant disease remains an enormous and burdensome challenge. If only we could just stop cancer in its tracks—prevent it before it strikes. Perhaps we can.” Indeed, perhaps we can with salicylic acid, the plant phytonutrient that’s marketed as aspirin. How does aspirin affect cancer? The Nobel Prize for Medicine was awarded to the team who discovered how aspirin works. Enzymes named COX (cyclooxygenase) take the pro-inflammatory, omega-6, fatty-acid arachidonic acid our body makes or we get directly in our diet (primarily from eating chicken and eggs), and turns it into inflammatory mediators, such as thromboxane, which produces thrombosis (clots), and prostaglandins, which cause inflammation. Aspirin suppresses these COX enzymes. Less thromboxane means fewer clots, and less prostaglandin means less pain, swelling, and fever. However, prostaglandins can also dilate the lymphatic vessels inside tumors, allowing cancer cells to spread. So, one way cancer tries to kill us is by boosting COX activity. We think one way aspirin can prevent cancer is by counteracting the tumor’s attempts to pry open the lymphatic bars on its cage and spread throughout the body. Indeed, reduction in mortality due to some cancers occurred within two to three years after aspirin was started. That seems too quick to be accounted for by an effect only on tumor formation. Cancer can take decades to develop, so the only way aspirin could work that fast is by suppressing the growth and spread of tumors that already exist. Aspirin appeared to cut the risk of metastases in half, particularly for adenocarcinomas, like colon cancer. Given this, should we all take a daily baby aspirin? Previous risk-benefit analyses did not consider the effects of aspirin on cancer, instead just balancing cardiovascular benefits with bleeding risks, but these new cancer findings may change things. If daily aspirin use were only associated with a reduction of colon cancer risk, then the benefits might not outweigh the harms for the general population, but we now have evidence that it works against other cancers, too. “[E]ven a 10% reduction in overall cancer incidence…could tip the balance” in favor of benefits over risks. How does the cancer benefit compare? We know that using aspirin in healthy people just for cardiovascular protection is kind of a wash, but, by contrast, the cancer prevention rates might save twice as many lives, so the benefits may outweigh the risks. If we put it all together—heart attacks, strokes, cancer, and bleeding—aspirin comes out as protective overall, potentially extending our lifespan. There is a higher risk of major bleeding even on low-dose aspirin, but there are fewer heart attacks, clotting strokes, and cancers. So, overall, aspirin may be beneficial. The aspirin phytonutrient salicylic acid isn’t just found in willow trees, but throughout the plant kingdom, from blackberries and white onions to green apples, green beans, and beyond. This explains why the active ingredient in aspirin is found normally in the bloodstream even in people not taking aspirin. The levels of aspirin in people who eat fruits and vegetables are significantly higher than the levels of those who don’t. If we drink just one fruit smoothie, our levels rise within only 90 minutes. But, one smoothie isn’t going to do it, of course. We need to have regular fruit and vegetable consumption every day. Are these kinds of aspirin levels sufficient to suppress the expression of the inflammatory enzyme implicated in cancer growth and spread, though? Using umbilical cord and foreskin cells—where else would researchers get human tissue?—they found that even those low levels caused by smoothie consumption significantly suppressed the expression of this inflammatory enzyme on a genetic level. 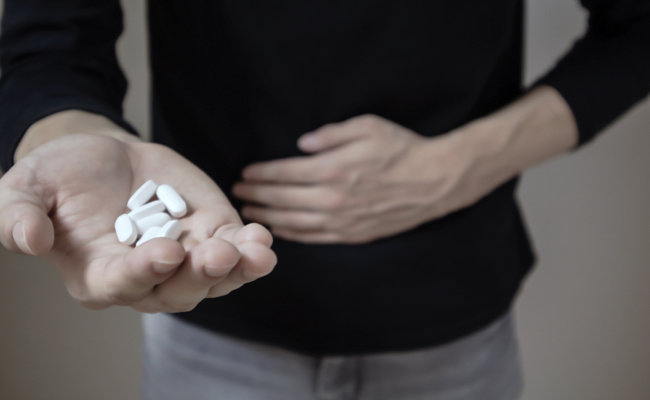 Aspirin can chew away at our gut. With all that salicylic acid flowing through their systems, plant-eaters must have higher ulcer rates, right? No. Both vegetarian women and men appear to have a significantly lower risk of ulcers. So, for the general population, by eating plants instead of taking aspirin, we may not only get the benefits without the risks, we can get the benefits with even more benefits. How is this possible? In plants, the salicylic acid can come naturally pre-packaged with gut-protective nutrients. The researcher notes that while “[d]ark green leafy vegetables…are among the richest dietary sources of nitrate…it may be unrealistic to expect people to eat ample servings of these every day,” so we should just give people pills with their pills, but I say we should just eat our greens. People who’ve had a heart attack should follow their physician’s advice, which probably includes taking aspirin every day, but what about everyone else? I think everyone should take aspirin—but in the form of produce, not a pill.